We pride ourselves on our partnering approach and ensuring that learning is implemented on the job. A “hand-holding” approach that is the cornerstone of our methodology. We want people to see training as a process. NOT an event. Our 4-step method provides depth and relevance to training initiatives and ensure that the lessons learnt are practiced / implemented on the job. We have trained corporates across 15 countries and these include global multinationals, regional players as well as local conglomerates. We usually create long term relationships with our clients to support their longer term strategies. 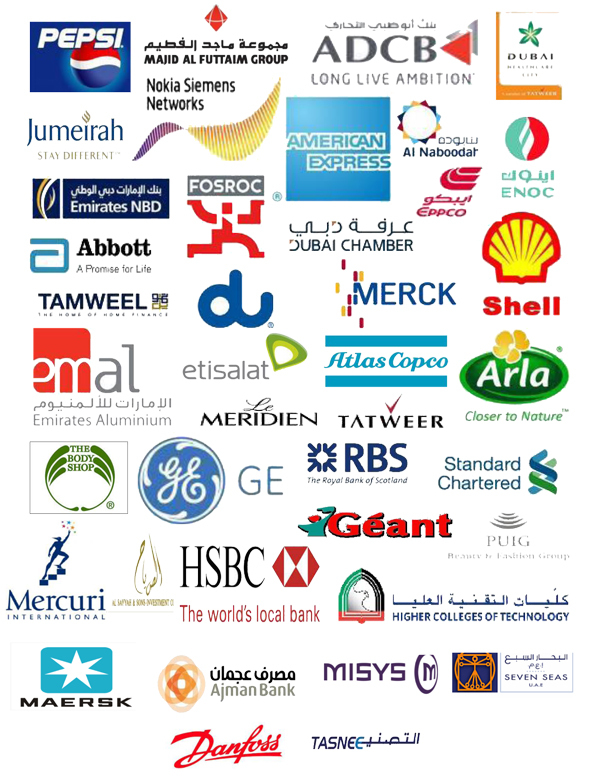 A sampling of some of the corporates we have worked with across 15 countries. We represent several international brands that provide us with the depth and international recognition that is an integral part of our offering. Our introduction and profile brochures are available in the "Downloadable Documents" section of this website.